During April’s Percona Live MySQL Conference and Expo 2014, I attended a talk on MySQL 5.7 performance an scalability given by Dimitri Kravtchuk, the Oracle MySQL benchmark specialist. He mentioned at some point that the InnoDB double write buffer was a real performance killer. For the ones that don’t know what the innodb double write buffer is, it is a disk buffer were pages are written before being written to the actual data file. Upon restart, pages in the double write buffer are rewritten to their data files if complete. This is to avoid data file corruption with half written pages. I knew it has an impact on performance, on ZFS since it is transactional I always disable it, but I never realized how important the performance impact could be. Back from PLMCE, a friend had dropped home a Dell R320 server, asking me to setup the OS and test it. How best to test a new server than to run benchmarks on it, so here we go! ZFS is not the only transactional filesystem, ext4, with the option “data=journal”, can also be transactional. So, the question is: is it better to have the InnoDB double write buffer enabled or to use the ext4 transaction log. 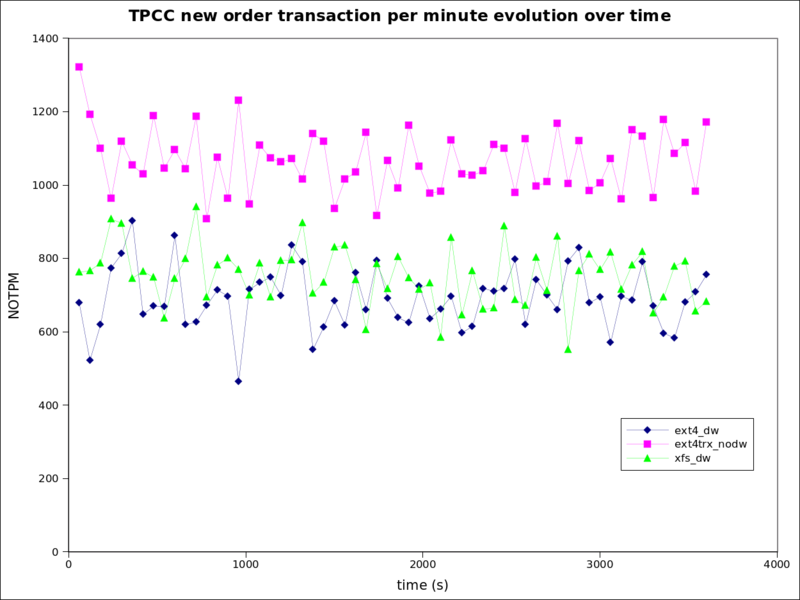 Also, if this is better, how does it compare with xfs, the filesystem I use to propose but which do not support transactions. I used 32 connections, let the tool run for 300s of warm up, enough to reach a steady level of dirty pages, and then, I let the benchmark run for one hour, reporting results every minute. 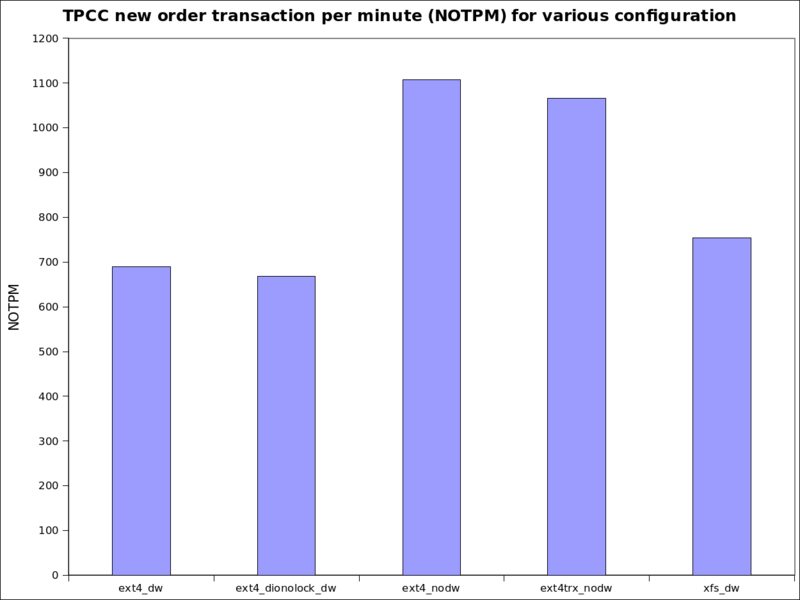 So, from the above table, the first test I did was the common ext4 with the Innodb double write buffer enabled and it yielded 690 new order transactions per minute (NOTPM). Reading the ext4 doc, I also wanted to try the “dioread_nolock” setting that is supposed to reduce mutex contention and this time, I got slightly less 668 NOTPM. The difference is within the measurement error and isn’t significant. Removing the Innodb double write buffer, although unsafe, boosted the throughput to 1107 NOTPM, a 60% increase! Wow, indeed the double write buffer has a huge impact. But what is the impact of asking the file system to replace the innodb double write buffer? Surprisingly, the performance level is only slightly lower at 1066 NOTPM and vmstat did report twice the amount writes. I needed to redo the tests a few times to convince myself. Getting a 55% increase in performance with the same hardware is not common except when some trivial configuration errors are made. Finally, I used to propose xfs with the Innodb double write buffer enabled to customers, that’s about 10% higher than ext4 with the Innodb double write buffer, close to what I was expecting. The graphic below presents the numbers in a more visual form. In term of performance stability, you’ll find below a graphic of the per minute NOTPM output for three of the tests, ext4 non-transactional with the double write buffer, ext4 transactional without the double write buffer and xfs with the double write buffer. The dispersion is qualitatively similar for all three. The values presented above are just the averages of those data sets. I observed no corruption. I was still a bit preoccupied, what if the test is wrong? I removed the “data=journal” mount option and did a new run. I got corruption the first time. So given what the procedure I followed and the number of crash tests, I think it is reasonable to assume it is safe to replace the InnoDB double write buffer by the ext4 transactional journal. I also looked at the kernel ext4 sources and changelog. Up to recently, before kernel 3.2, O_DIRECT wasn’t supported with data=journal and MySQL would have issued a warning in the error log. Now, with recent kernels, O_DIRECT is mapped to O_DSYNC and O_DIRECT is faked, always for data=journal, which is exactly what is needed. Indeed, I tried “innodb_flush_method = O_DSYNC” and found the same results. With older kernels I strongly advise to use the “innodb_flush_method = O_DSYNC” setting to make sure files are opened is a way that will cause them to be transactional for ext4. As always, test thoroughfully, I only tested on Ubuntu 14.04. Since we are no longer really using O_DIRECT, even if set in my.cnf, the OS file cache will be used for InnoDB data. If the database is only using InnoDB that’s not a big deal but if MyISAM is significantly used, that may cause performance issues since MyISAM relies on the OS file cache so be warned. If you have a SSD setup that doesn’t offer a transactional file system like the FusionIO directFS, a very interesting setup would be to mix spinning drives and SSDs. For example, let’s suppose we have a mirror of spinning drives handled by a raid controller with a write cache (and a BBU) and an SSD storage on a PCIe card. To reduce the write load to the SSD, we could send the file system journal to the spinning drives using the “journal_path=path” or “journal_dev=devnum” options of ext4. The raid controller write cache would do an awesome job at merging the write operations for the file system journal and the amount of write operations going to the SSD would be cut by half. I don’t have access to such a setup but it seems very promising performance wise. Like ZFS, ext4 can be transactional and replacing the InnoDB double write buffer with the file system transaction journal yield a 55% increase in performance for write intensive workload. Performance gains are also expected for SSD and mixed spinning/SSD configurations. So if it is using the OS file cache, doesn’t that mean some unnecessary double buffering (once in the buffer pool, once in the OS cache)? I was toying with an idea similar to yours with the RAID Controller and BBU, I was thinking of just putting the doublewrite buffer (and maybe innodb logs) onto the RAID controller, perhaps just attaching two small SSD. I may post again once I have some hardware available. If someone were to come up with a sort of PCIe Ramdisk with a BBU (or better, capacitors) at a competitive price, that would be a great alternative to RAID controllers, especially since the CoW filesystems like ZFS and btrfs usually also implement RAID in software. What is the perf benefit for a system with HW RAID and battery backed write cache? The question I have in this case – do we know why does it happen ? Did you have a chance to check the amount of writes going to device in this case ? Here is what puzzles me. As I understand ZFS simply stores the new data in the new location, hence it only needs to update meta-data to show where the new data is located. EXT4 with data=journal is I understand correctly just stores data in the journal as well as storing it in location where it should be, so it still should double amount of writes as Innodb does. If I’m correct when do not we have some problem in how doublewrite buffer is implemented in Innodb – I do not see big reason why filesystem should be able to do it a lot more efficiently. Or has design of data=journal changed in EXT4 ? I also wonder whenever results for SSDs and RAID with BBU are the same as this is where you can get dramatic differences as any “sync” is very expensive on conventional hard drives and it is much cheaper on system with BBU or SSD. @MarkC: If you send the ext4 journal to a file on an array behind a raid controller with a write cache and a BBU, it may actually never be written to disk and stay in the write cache memory since the max journal size with 4KB pages is 400MB. In such a case, spinning disks will even be faster than SSDs. @Alan: The issue with the double write buffer is really internal to MySQL, those 64 pages are running hot and force some kind of serialization. @Peter: My explanation to this is the serialization effect of the double-write buffer, in order to use some of the 64 pages in it, a thread must wait for the write operation of another thread to complete its write to the data file. I did measure the amount of writes in both cases and yes, they are the same but the ext4 journal seems to better handle concurrency. As of testing with SSDs and a raid controller with BBU, I’d love to do that, any hardware I could use for a few hours? your results are looking very promising!! thanks for sharing! the only point with this EXT4 feature remains unclear for me: will EXT4 really guarantee the absense of partially written pages?.. (keeping in mind that EXT4 is operating with 4K, while InnoDB default is 16K, and EXT4 knows just nothing about InnoDB data, so for EXT4 “commited” 2 pages of 4K will remain safe, while there will be still 2 other pages “not comitted” and breaking a 16K page for InnoDB).. — any idea?.. and, yes, regarding generally the “double-write buffer” feature – its main bottleneck on a fast storage will be its own kind of serialization due implementation design.. One of the solutions could be here to have several such buffers (ex. one per BP instance) to increase the throughput (while the issue with twice written data will still remain); or bypass the “buffer” and let each page double write go independently to others, etc..
or the best of the best is simply to avoid double write buffer completely by involving atomic writes, but unfortunately currently it’s available only on Fusion-io and not yet a common standard..
EXT4 really guarantee the absense of partially written pages?.. go independently to others, etc..
it’s available only on Fusion-io and not yet a common standard.. When you use O_SYNC or O_DSYNC, if you do a 16KB write operation with data=journal, it is transactional, you can’t have a fraction of 16KB written. It is the exact same principle has transaction in a database. Best way to convince yourself is to try 🙂 I did many many tests recently. I am trying to get hold on server with raid_ctrl/BBU/spinning and a PCIe SSD card. I’ll redo the benchmarks splitting the journals (ext4 and innodb) on spinning drives and datafile on SSD. great then if it’s so!.. I may have access soon to a system with a RAID Controller, BBU and a combination of SSD (only SATA though) and HDD. I will run a few tests with different combinations of log, data, doublewrite etc. location. Interestingly, there is already a controller for a PCIe based RAM drive that backs up into Flash, the IDT 89HF08P08AG3 . Seems like nobody so far built a device based on it. Just a follow-up to this post, I tried it on a busy system and there was a rather peculiar effect where the system would just stall at a determinable (is that a word?) moment. The result was a single MySQLd process hogging 100% of one CPU and every other thread stalling. This didn’t happen with data=writeback and I think I have isolated the problem to this mount option. Use caution. @Nils: I pushed quite hard on the server I tested and I never saw that behavior. I may also get access to a server with a raid ctrl, bbu and fusion io card, can you tell me more about your setup so that I can try to reproduce your results. We found something *amazing* with EXT4. If you disable journaling on EXT4 with tune2fs -O "^has_journal" /dev/ , our TPS according to sysbench increased from a terrible 10/sec to 600/sec. This is on a soft raid of 2 7.2k HDD drives with 10GB innodb buffer. Disabling double-write only increased the old figure to 20/sec, which is nothing. Where jbd2/md2-8 (the journalling engine) caused most of the waiting on io. Gopi Aravind: disabling journaling destroys durability, methinks. I have the same result as Nils. @Alex, unless it has been backported, O_DIRECT is not supported by the kernel before 3.2, that’s why the last test performs well. Newer kernels maps to O_DSYNC. Now, regarding the bad results for the first test, there have been a lot of changes to ext4 in the 3.0+ kernel era, could this be just a bad mutex that got fixed? I’ll try to reproduce you result on a Centos6 box, could you retry on your side on a more recent kernel, 3.2+ kernel. > I’ll try to reproduce you result on a Centos6 box, could you retry on your side on a more recent kernel, 3.2+ kernel. @Alex: I have reproduced my results on 2 different servers (ubuntu 14.04 and Centos6 with 3.18 kernel) very easily but I struggled to reproduce yours. I finally succeeded partially using SSD storage. Apparently, SSD storage doesn’t stress the doublewrite buffer which kind of make sense. I’ll write a follow up post on the matter. @Yves, I am experiencing some poor write performance and came about this post. As per your last post, did you ever do any additional testing with SSD? Is it worth trying to disable it in that case? I was thinking about turning the double write buffer in a MySQL instance that was set up with a 4 KB page size on top of an iSCSI storage with physical block size of 4 KB, but my colleagues are not so convinced this is a good idea due to other elements in the storage stack (Linux LVM, xfs). Any thoughts on that?